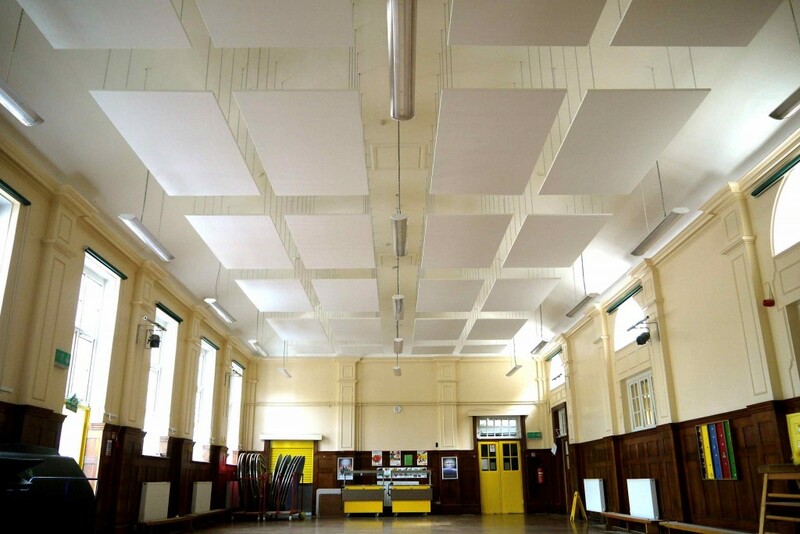 To design and install a sound absorbing system to reduce reverberation times inside the school’s main assembly hall, to comply with Building Regulations – Part E4 – Acoustic Conditions in Schools. (Resource areas in schools must provide adequate protection against noise disturbance, appropriate to their intended use. In terms of reverberation times, within a resource area in excess of 300m3, this equates to Tmf,max <=0.4 seconds). To design and install a system compatible with the assembly hall’s day-to-day usage, notably, as a refectory and play area, i.e. involving activities likely to cause staining and impact damage to any application located too ‘close at hand’. To design and install a system that’s fire-safe and sustainably sourced. 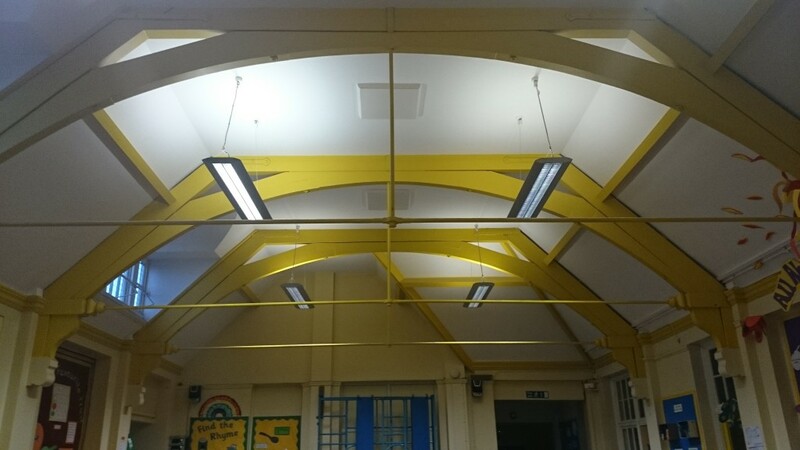 A site survey was carried out, which included sound testing – measuring existing reverberation times at 3.1 seconds. The data recorded was used to calculate the sound absorptive surface area coverage and configuration required inside the assembly hall. 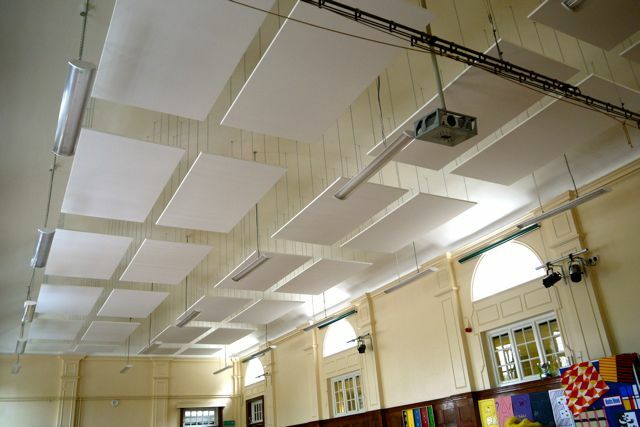 Accordingly, a ceiling-suspended system was designed, utilising fabric-wrapped acoustic panels (Class 0 fireproof rated). A method statement, risk assessment and schedule of works were formulated, detailing the installation process. The system was installed, on schedule and to budget. On completion, it was tested and inspected to verify compliance with the pre-specified acoustic performance criteria. The system complied with Building Regulations – Part E4. Consequently, school staff and pupils can communicate more effectively, making activities, within the assembly hall, safer and more productive. 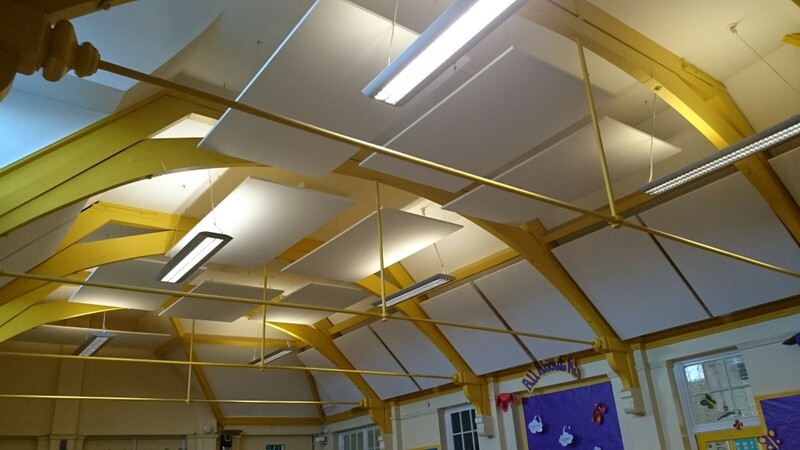 Because the acoustic panels were ceiling-suspended, they are less susceptible to staining and impact damage, i.e. compared with a wall-mounted application. 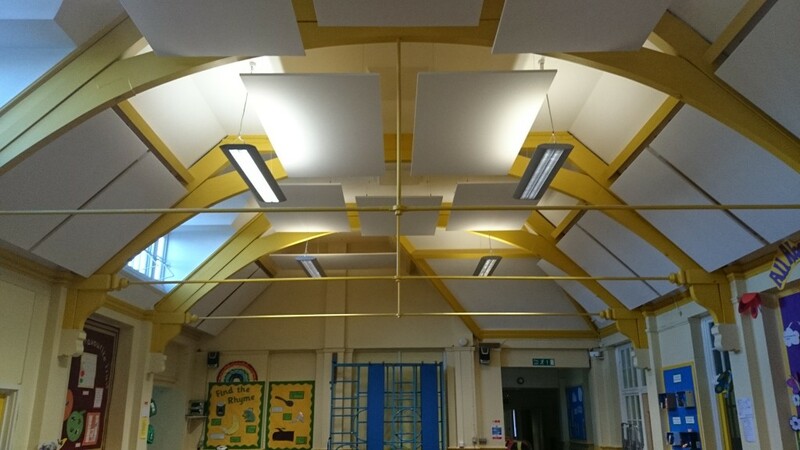 School staff noted that the “striking, yet simple” appearance of the acoustic panels provides a visually stimulating feature, that engages the children’s imaginations.